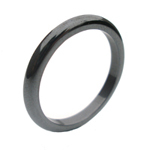 Notice: Hematite rings are not made of metal but, rather, of a mineral crystal, in one hand: stone. As such they are fragile and may not be suitable as wedding rings. Known already as an attractive material for jewelry in ancient times, this gemstone's name, Hematite, is derived from the Greek word standing for "blood" due to the red overtones of it when ground into powder. Hematite jewelry was highly sought and popular in Europe during the Victorian era, and regained popularity in when rediscovered in jewelry pieces curved by native American. Known best as curved and sculptured pieces, it sports a unique, unmatched dark metallic color, a shade of smoky-silvery black, with this unique, Tahitian-pearl-like luster, and an unmistaken shiny charcoal charm. It has been chosen by our designers as a precious addition to our Black Zone, being ever so close in color to our Black Titanium and Black Zirconium collection. No other stone, other than Onyx, can claim the same dramatic statement of black elegance and beauty. Hematite jewelry items must be handled with care as, despite their metallic look, they are, after all, a crystal that may chip or even break upon hitting a hard surface. 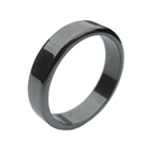 Similarly, one should consider carefully whether a Hematite ring is proper as a wedding band, due to the same considerations. We recommend Hematite bands at an imposing fashion statement when worn stacked 3 to 4 of them. For further suggestions do not hesitate to address us.